Kingower, formerly a gold-mining town, is a village 12 km south-west of Inglewood and 45 km west of Bendigo. It is not on any arterial road, and is on the south-eastern edge of the Kooyoora National Park in which lie several of Kingower’s gold leads. Kingower was named after the Kingower pastoral run (1843), and the name was probably derived from an Aboriginal word which referred to a yam endemic to the area. 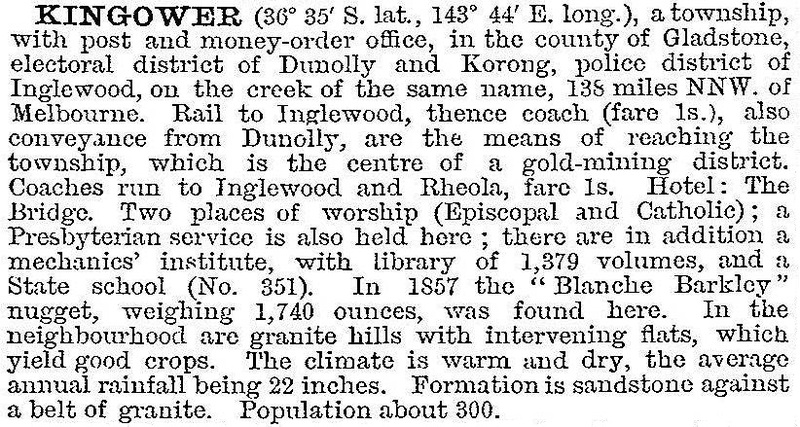 Gold was discovered at Wedderburn (west of Kingower) and at Moliagul (south of Kingower) in 1852. In 1853 the Kingower goldfields was discovered by John Mechosk, a few months after he had uncovered the Tarrangower (Maldon) goldfields. The field rapidly gained fame for large nuggets, being called the potato diggings because of the size and appearance of the nuggets. By 1854 there were an estimated 5000 miners. In 1857 the most famous nugget, named the Blanche Barkly after the daughter of Victoria’s Governor, was found, adding further to Kingower’s fame. A school was opened in 1858 by the proprietor of the Glenalbyn pastoral run, the Reverend William Hall. The run was a short distance north of Kingower, and Hall’s homestead, Glenalbyn Grange built in the early 1860s, remains in a substantially intact condition. It is situated near a fork in the Kingower Creek, north-east of the Kooyoora National Park, and is on the Victorian Heritage Register. Until 1860 the Kingower ‘township’ followed the ebb and flow of gold finds. A survey was carried out in that year, choosing to locate a permanent township around the most closely settled area. The Kingower and Wedderburn Road District was proclaimed in 1862, the forerunner of Korong shire. In 1865 Bailliere’s Victorian gazeteer described Kingower as still being mostly surface diggings, having only one quartz-crushing machine. There were two hotels and a mechanics’ institute. In 1871 an Anglican church, made from local stone, was constructed in the township, replacing the one built by Reverend Hall near his school. It was the seventh church designed by Hall, and his biggest and grandest. Hall was also a local councillor and shire president. The township school was built in 1882, continuing until 1949. Employment was also found in timber cutting and eucalyptus-oil production in the Kooyoora and Kingower State parks. Kingower has the Bridge Hotel (private residence), an historic cemetery and two vineyards – Blanche Barkly (1972) and Passing Clouds (1974). The Anglican church was sold in 2012 and a last service was held in July of that year.